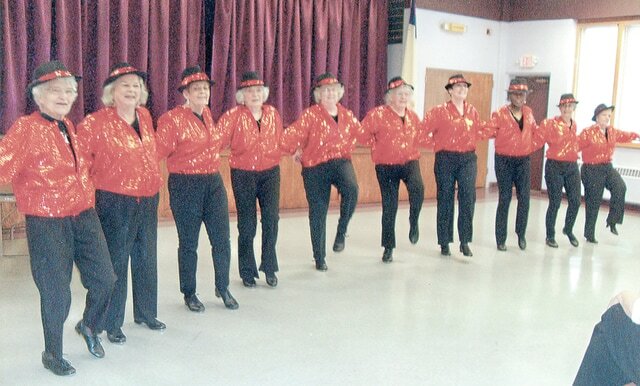 Courtesy Photo “Strut Your Stuff” tap dancers include one former teacher and two members who are 82 years old. The group has been performing for more than ten years and member Susan Garverick Ness is a Northmor Alumna. The “Strut Your Stuff” tap dancers from the Richland Academy entertained members of the Morrow County Retired Teachers Association when they met for their quarterly luncheon June 1st at Trinity UM Church. Retired from a variety of occupations, the dance troupe included one former teacher and two members who are 82 years old. The group has been performing for more than ten years. Member Susan Garverick Ness is a Northmor Alumna. President Pat Rinehart opened the business meeting by thanking those who baked and packaged cookies for “Teacher Appreciation Week.” These were distributed to nearly 500 teachers around the county. Several committee reports were given. Linda Ruehrmund, Seniors on Center board president, expressed appreciation for the responses to their recent survey and asked for volunteers to lead classes and special activities. Lindsey Kohlenburg, legislative chairman, told of bills before the Ohio Legislature pertaining to the status of women and children and urged members to contact their representatives. The six MCRTA members who had attended the ORTA Leadership Conference on April 23 commented on the sessions and speakers. MCRTA received a $75.00 award for record completion. ORTA District V director Mary Thomas, also a MCRTA member, urged joining ORTA and supporting its efforts to “go to bat” for retired teachers. Pat Maxwell reminded members of upcoming book sales at area libraries which are good sources of children’s books for MCRTA’s Christmas distribution. Marilyn Weller was thanked for the clever table centerpieces promoting summer events. Angie Hamilton was the successful bidder for the pecan pie baked by Pat Rinehart, with the proceeds to be added to the Scholarship Fund. The Executive Committee will meet at the Edison UM Church on August 24 at 10 a.m.
John Buch will speak on services offered to members by STRS at the October 5th luncheon.